New York, NY, June 11, 2014, Katie Rose Littlejohn, Owner and President of R.R.L. 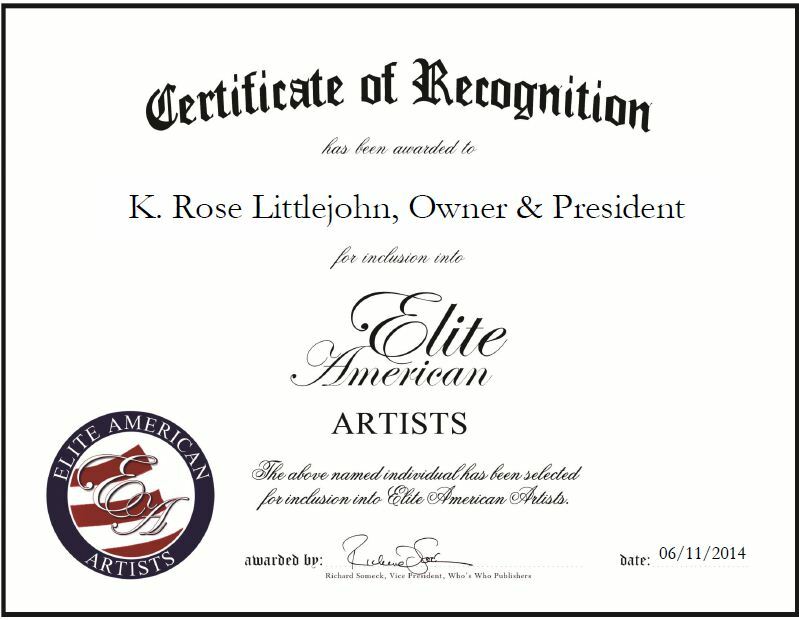 Fine Art, has been recognized by Elite American Artists for dedication, achievement and leadership in selling fine art. When she was 12 years old, Ms. Littlejohn was extremely curious about the attic of her historical home because her mother had four solid iron trunks up there. She started opening the trunks and found the most magnificent gray paper manuscripts that her great great grandmother acquired from other relatives that lived in Europe; they were luxury pieces that didn’t get displayed. This inspired her to pursue a career in fine art. Ms. Littlejohn has more 40 years of experience in art collecting, consulting, and private dealing. She mostly works with early 19 and 20 century fine art, impressionist, American master post impressionist and German expressionist sculpture art. Aside from selling and collecting art, Ms. Littlejohn also does restorations in museums. She has restored art for museums in London, Prague, Paris and Germany, as well as major pieces of Goya Vatican and Rembrandt. She loves seeing the work come back to life. Ms. Littlejohn lived in Europe and made wonderful contacts. She had the most magnificent mentor and met Dali Miro Chagall David. She also spent 14 years in Paris and New York, and went to Beaux Arts. She attributes her success to her mother, who maintained her collection. Ms. Littlejohn was fascinated by the work and used to go all around Europe to find old papers; the ones she received were torn and had missing parts or holes, and she would dissolve, build and replace them. In the coming years, Ms. Littlejohn plans to belong to every museum on call for any major catastrophes and help the police with stolen artifacts. She also wants to find other major works of art that are not outrageous, and help to exhibit and expose four artists. In addition, she owns about 800 art pieces that she would like to see gain recognition. This entry was posted in Art collecting and tagged 19 and 20 century fine art, consulting, impressionist, private dealing, restoration, selling. Bookmark the permalink.